If Gita or Bhagwat Gita is most misunderstood book or holy scripture/speech than among those who were born on this earth, Buddha who was also known as Sidhartha once, is the most misunderstood person. Frequently misquoted and misunderstood. As a Prince he had difficulty in accepting the realities of life which everyone so easily accepts and as a hermit he easily accepted harsh actuality of the earth without a murmur. His attempt to communicate, as always, faced linguistic hurdles created by ignorant people. A person came to Buddha and started shouting to him in harsh words and abuses. Buddha remained unmoved. The abuser raised his voice further and abuses filthier. This also did not move Buddha. He physically assaulted Buddha, whereupon, the Buddha who was sitting in lotus position, fell down on his back. Now satisfied that Buddha had been hurt this man left. This story is frequently quoted to show the compassion of Buddha but that is only small part of it. The real point to notice is the absolute dynamism of human nature. This story truly demonstrate that a person is nothing but his “thought”. If the thought is not the same, the person is also not the same. And if “thought” is the person, where is ‘the person’? Or in other words, there is no fixed ‘person’ or “identity”. Thus affirming the ‘Sunyata’ or voidness or emptiness or absence of intrinsic reality. In nut shell, it is said, that Middle Path or Third Way is to remain in the middle and avoid extremes either of indulgence or of self-mortification. But that is not all. In the absence of any intrinsic identity in people or other objects (in view of constant changes) the world in which we exist also lacks intrinsic identity or is thus Sunya or Zero or Empty. The Middle path is, neither ignoring what seem real nor adhering to the unreal. Yes, it is difficult to understand what to say practice. That is why who can do it is called Tathagat or The Perfect One. Time is equally harsh on God as on beggarman. 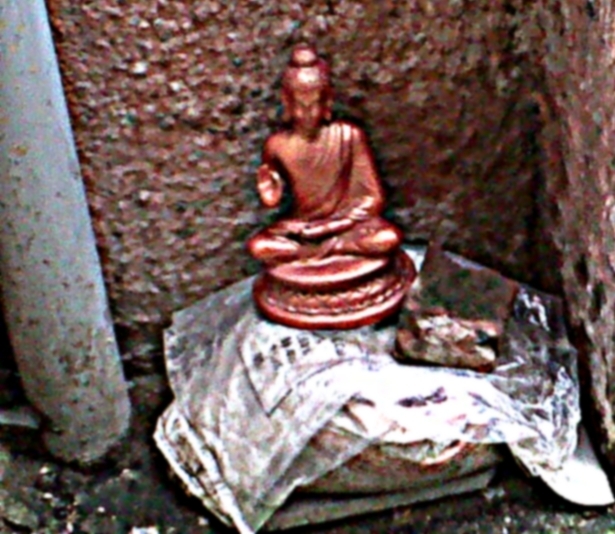 The above picture is of a statue abandoned and left out side a residential building next to a rain drain. On a closer look, it appeared that statue has hairline cracks. Perhaps it’s owner could not decide what to do with broken statue. Convenience matters in everything. Indecisive in two thoughts to throw the statute or to keep it, the owner seem to have devised his own middle path i.e. to pass the buck to neighbor to decide. It is unfortunate that the Buddha who denied the identity or existence of reality or of any person has his images installed all over the world and actually/physically worshipped. People always do what they like to do and name it Third Path or some other label or for that matter anything and everything. This entry was posted in Philosophy & Religion and tagged Buddha, Conscious living, Gautama Buddha, God, Middle Way, Religion and Spirituality, Third Way. Bookmark the permalink.